Customers of the Kingsfold builders’ merchant D.W. Nye have helped to raise £252 for Horsham charity Born Free. Throughout December, D.W. Nye’s eye-catching and edible Gingerbread House – baked and constructed by Horsham resident Kat Gianni – was on display at the depot. Local residents were invited to guess how many sweets were hidden inside it in return for a suggested donation to the charity of £1 per entry. 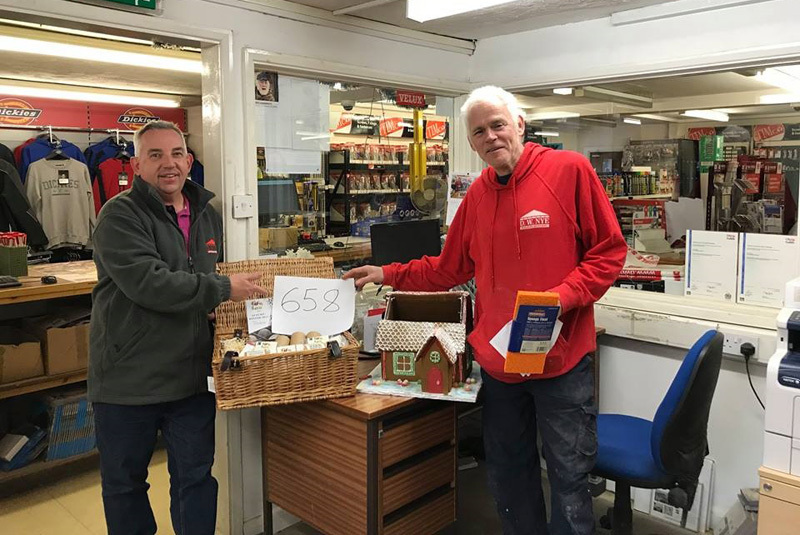 The winner with the closest estimate was announced as Kevin Winlow from Denne, who was only four sweets short of the actual total of 658. Depot manager Duncan Tidy presented Mr Winlow with a Luscious Hamper worth £75 courtesy of Cocoa Loco at Swan Walk.